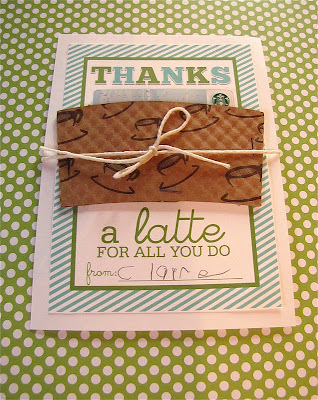 " The Modest Homestead: Gift Idea: Thanks a latte! 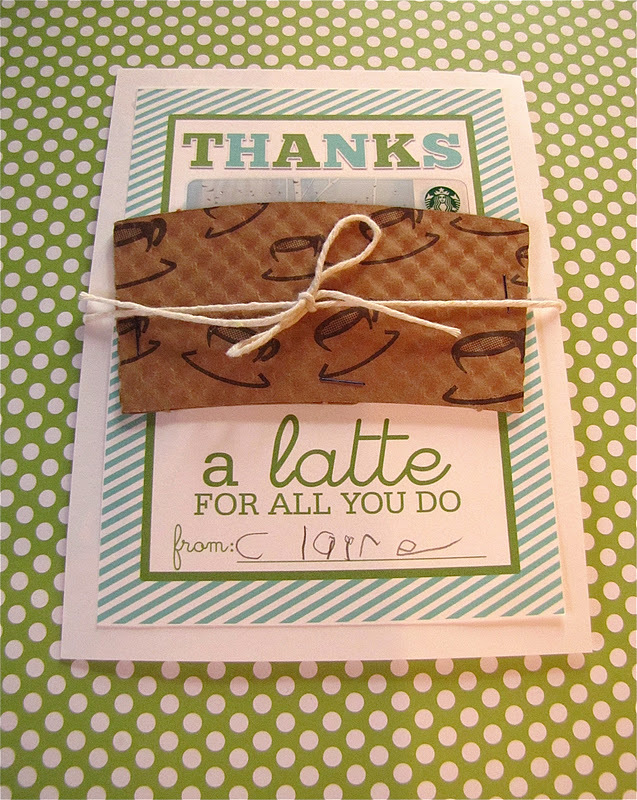 Gift Idea: Thanks a latte! Thanksgiving is this week! I can't believe how fast the month has gone! Today is Claire's last day of school for the week so to show her teacher how much we're thankful for her Claire surprised her with this card. 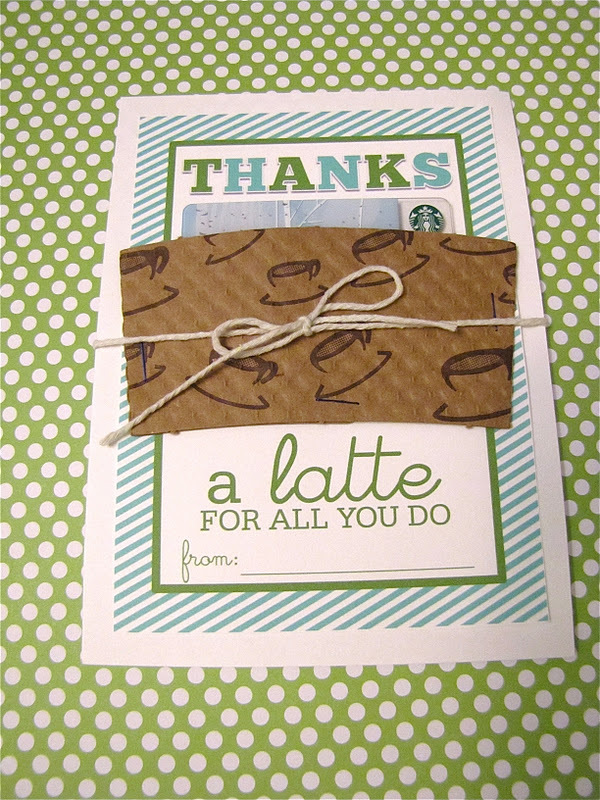 I'm always looking for cute ideas to spiff up a plain gift card. I saw a version of this one on Pinterest and it was just perfect! To put it together I printed out the 5x7 printable and cut it out. Then I taped it to white card stock that I cut slightly bigger than the print out. 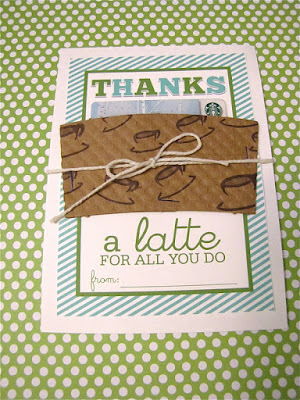 I used double sided tape to close the bottom of the coffee sleeve and put one staple in the middle so I could use it as a pocket to slide my gift card into. I put one staple on each side of it to secure it to the card. Then tied a bow around it with twine. I just used twine I had in my kitchen, but if you'd like to spiff it up a bit more you can get a variety of colors here. I made two since the teacher's assistant in Claire's class is wonderful also! Claire signed it with her new name writing skills. I'm so proud of her! It's kind of like when your kids start going in the potty for the first time. Parents get excited about the little things ya know. Here is another gift idea in case your teacher prefers soda. I gave this to Claire's swimming teacher this past summer who was very patient with my little fish! Saw you on Sugar Bee Crafts...had to come check out this cute idea! I'm following, hope you'll come follow back at FARMHOUSE PORCH! Thanks for liking my Apple Pie Pops! I'm following you back - you have so many cute tutorials! Very nice!!! This is a great idea!! So cute too!! I'm a new follower!! These are so cute! Thanks for stopping by and following - I'm following back and looking forward to seeing more!